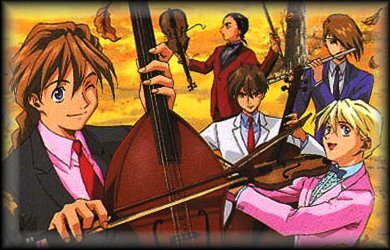 "This will be my final performance..."
Whether Heero, Duo or Wufei know how to play instruments or not, I wouldn't know. But I do know that all five of them have perfect singing voices, courtesy of their wonderful seiyuus! Showcased are some MP3s, midis and sound files as well as lyrics to the various songs of Gundam Wing, to show that these guys are just as good at singing as blowing up Mobile Suits! "Don't worry, this will be the best performance you have ever seen." Shin Kidousenki Gundam Wing is copyrighted © Sunrise, Bandai and the Sotsu Agency. All rights reserved. "Endless Dedication" and its contents are property of Shikami Yamino © 1999-2002.